"Not much to complain about in Sony's test run for their most cinematic exclusive franchise"
Full disclosure: Playing the Uncharted 4: A Thief's End multiplayer beta/stress test was the first time I've ever touched any Uncharted game. I don't know much of anything about the series other than that Nathan Drake is voiced by Nolan North, and he has Hollywood-style good looks. So I'm looking at this multiplayer from the perspective of a newcomer. I don't know anything about the characters or the environments, so this is just about whether the game was fun or not. I could care less about the fanservice aspects of the beta (if one exists), because I'm not a fan. Having said all that, I legitimately had a good time with this beta overall. But let's break this down by the aspects that stood out most. [caption id="" align="aligncenter" width="625"] The cover system and different classes means players can succeed with drastically different approaches to the same situation - if they're properly equipped for it. [/caption] Uncharted 4, unsurprisingly, looks and plays very nice. The multiplayer is a pretty standard class-based shooter, and the shooting mechanics are perfectly functional, if not unusual or special. The combat is largely cover-based, and moving in and out of cover feels fluid and fast. By contrast, trying to fight while out of cover - or getting flanked while in cover - is a recipe to get gunned down immediately. The maps and equipment in the game are geared around those cover mechanics. I don't think I've ever seen a multiplayer shooter in which smoke bombs are regularly deployed and serve a useful purpose, but they got tossed around in almost every match I played. Part of the reason for this is a notable focus on patience and tactics, rather than running-and-gunning. Classes are clearly built to be either short or long-range, and maps are built with a number of long, straight corridors with distributed waist-high cover. These areas are where the long-range classes shine, with the ability to snipe or set traps at the far end of an area from relative safety. The foil to this for short-range classes is the smoke bomb. The smoke bomb completely obstructs visibility in a massive radius, allowing short-range characters to close the distance without being filled with holes. As a sniper class watching the other end of the room, I tried to wait for the smoke to clear and take my shot, but characters move quick, so before I could react, I took a shotgun blast to the face. I can see a logic and balance to the classes once the multiplayer has multiple modes, but the beta included only Team Deathmatch, so it seemed that the Assault class was the most viable. It could be that I'm not a particularly skilled sniper or smart enough to set good traps, but overall it just seemed that the weaponry and equipment with the Assault class was the most effective at simply mowing down opponents. Still, I was pleased with the variety of classes and equipment choices, and there is no doubt that the choice of classes drastically changes the way players should approach each situation, which is key for a class-based multiplayer shooter. Note: I ran only with pre-set classes. The game gives players the option to choose a custom loadout, which I'm sure most people will when the game is in it's completed form, and that will probably tone down some of those differences in gameplay styles. Of particular interest is the "down" state like the Gears of War series. After taking a certain amount of damage, players go down to all fours , but able to crawl around to get to a safe location. If they can avoid taking more damage and get to an ally, that ally (regardless of class or equipment) can pick them up - but it takes several seconds and leaves that ally vulnerable, so it is imperative that a downed enemy crawl to safe cover. If the player takes more damage after going down (there is a special melee finish if the opponent is nearby), they are "KO'ed" and cannot be picked up. In deathmatch terms, a point is only scored by getting an opponent to "KO" state. Additionally, the down state may be skipped altogether if the player receives massive damage from an explosive, and a player who stays down without receiving either damage or help will eventually bleed out. The downed state was a fun wrinkle in the formula; because of it, deaths never felt cheap or too sudden, and team play is rewarded. If you get sniped from a half-mile away surrounded by allies, chances are you'll be picked up quickly. Additionally, the respawn timer includes the time you spend in the downed state, so while there is a button that allows players to accept a death, they won't respawn any faster, so there is little reason to do so. The Hunter, a quick ally who seeks out enemies near you to put into a chokehold, dealing damage and exposing them to fire. Your AI's achievements count towards your point total, so there's no need to worry about your sniper stealing your kill - it counts as yours either way. Heavy weapons are also available, and frankly these are the least interesting of the available power-ups. They are super-powered weapons, generally explosive or high-caliber ones, with a very limited number of shots. Simply put, they're stronger guns. Useful and powerful in the right hands, but not especially exciting, especially since nothing in the environment is destructible. But what is especially interesting is how players acquire the money to use in the in-game shop. Obviously, scoring KOs and reviving enemies is the main focus, but players can also acquire funds by locating and collecting treasures in key places on the map. The treasures re-spawn fairly frequently, and collecting them encourages exploration of the map alongside straight combat, since the powers offer players huge advantages in combat. In fact, the end-of-round rankings used "money" as the primary measure of who the leading player was, indicating there will probably be game modes in which collecting treasure is as important as combat if not more so. Additionally, collecting treasures often yields "relics," which can be used to unlock character customization options. These customization options, at least from what I can tell, are entirely cosmetic, as are the differences between the characters themselves, but hey, everyone loves hats! [caption id="" align="aligncenter" width="611"] This drop attack is avoidable, but it is a one-hit KO that feels REALLY good when it hits. 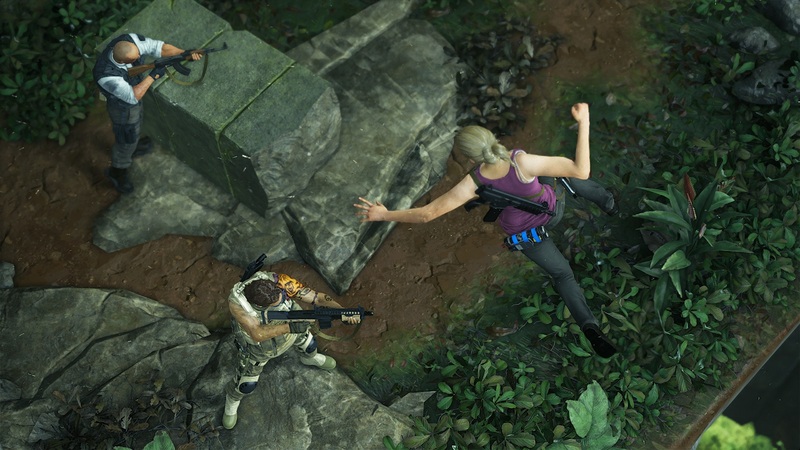 [/caption] The maps in the Uncharted 4 beta were among the most impressive aspect of the game, and not just because they looked good (they did) or were interesting thematically (they were), but because of the way they encourage varied movement mechanics. Running, climbing, vaulting, hanging from ledges, even grappling and rope-swinging were among the methods players use to get from place to place, and the maps are built to ensure you use all of them appropriately. When I started playing, I thought the rope-swinging mechanic was forced, as I was constantly looking around in the air for points to grapple to. But there is a certain logic behind the map designs that make it easy to learn where those grappling points are, and that in turn makes it easy to initiate a rope swing without even taking your eyes off the action. Swinging itself feels a bit slow, but gives you faster access to most areas than simply running and climbing, and it also enables a lethal drop attack (pictured above). Climbing is Assassin's Creed-levels of simple and fast, and there isn't anything too tall or complicated to get to the top of in multiplayer, though there are a number of treasures that require climbing to high places to acquire. You might also think that climbing to a high place provides a good sniper perch, but most of those places are open and exposed to fire, so it is frequently more dangerous to stay up there than it is useful. Hanging off ledges, however, was surprisingly viable strategically. Not only does it act as a form of cover, but you can actually poke up to fire a sidearm while hanging from a ledge, so you are actually both defensively and offensively capable in that position. 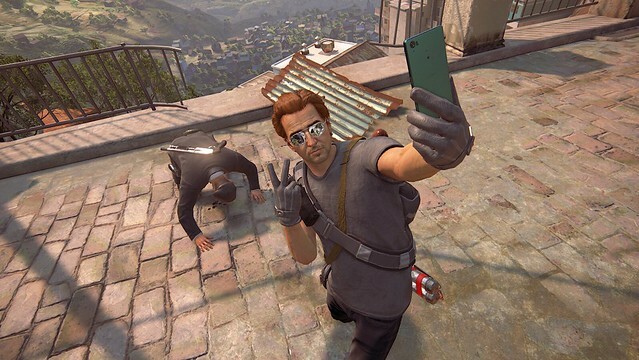 Of course, any place you can hang is a place someone can be right behind you with a weapon ready (you can't hang off the edge of the map), so it is a limited strategy, but it has a place and it shows how much thought Naughty Dog put into combining movement and combat. Ultimately, the smooth and varied movement capabilities made the game fun, even when not in combat. But the combination of the two made things even more enjoyable. [caption id="" align="aligncenter" width="640"] Accurate portrayal of my experience with the game. [/caption] For a beta of a game primarily known for its single-player campaign, this was quite polished. The game played smoothly, everything looked about like it should, and there were more maps, options and perks than I was expecting. Matchmaking took a little longer than I would have liked, and there was an instance where I had to re-boot the game because I wasn't getting placed into a match and was just kind of floating in no-man's-land for a bit. But considering this was a beta specifically for testing matchmaking issues and server strain, I'd say it was very reasonable. I'd hope that the time between matches is reduced a bit when the final product is released. Despite not spending a lot of time with multiplayer shooters, I found myself able to easily fall into this and enjoy myself, and I think the treasure-gathering mechanic will be a welcome inroad to new and casual players who can't always hold their own in a firefight. When Uncharted 4 goes live on May 10, I doubt many people will skip the story mode and head straight into the multiplayer. It isn't that kind of franchise. But anyone who finishes the campaign and wants to stay in Nathan Drake's shoes a little longer should have no trouble sinking several enjoyable hours into this surprisingly full-featured multiplayer.